That’s what happened the first time I picked up this produce gem at the grocery store. I was excited that I didn’t have to wait for my bananas to almost-spoil to yield the sweet, hearty treat. As I excitedly peeled and began to mash them, I sneaked a quick taste and was horrified. Why, these weren’t bananas at all. A quick reverse Google image search unearthed my grave mistake – plantains. A starchy, unsweet tropical cousin of the banana. I veered away from these gems for years until DTH showed me their rich depth of flavor, adaptability to sweet or savory flavorings and ability to be fried, grilled, or sautéed. For the 40 days we ate sugar and grain free, we often paired plantain chips with our proteins, and they never disappointed. After being inspired by fresh caught mahi and swordfish at the market this week, I was excited to give them a cast iron treatment. Add 2 generous spoonfuls of coconut oil to cast iron skillet and heat over grill or stove. When coconut oil has heated thoroughly, drop in thin slices of plantain (do not layer). When side in the oil is lightly browned, flip and cook other side until golden. Remove from heat. Place on paper towel. Continue pan frying. 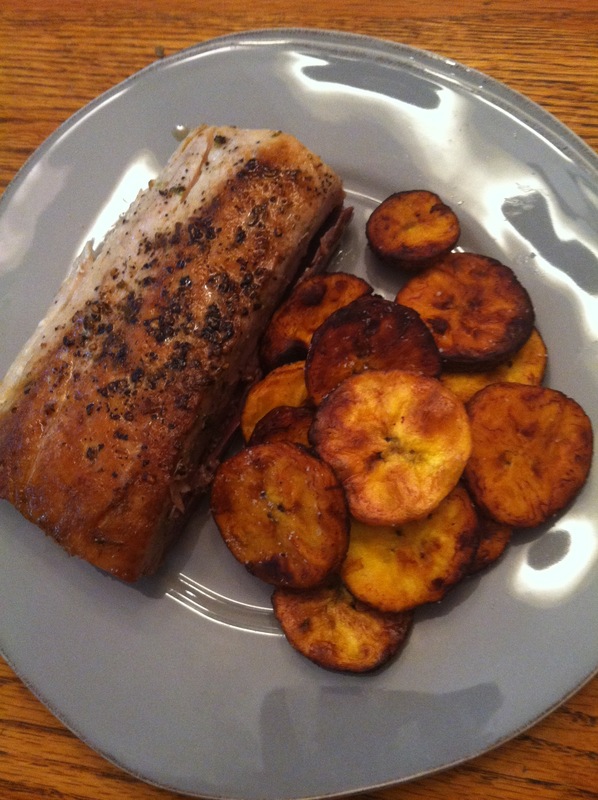 When all plantain slices are cooked, squeeze juice of one lime over fried slices and top with coarse sea salt. Serve warm. Add olive oil to large cast iron skillet. Heat over grill or stove. Season flesh side of mahi with coarse black pepper, sea salt and zest of 1 lime. When oil is heated, place mahi skin side down in cast iron pan. After 6-7 minutes, flip. Cook until mahi is cooked through.